Waffles have been a family favorite for generations and a recent survey showed that nearly 50% of those who eat waffles prefer homecooked to frozen ones. If you and your family like nothing more than waffles for breakfast or as a deliciously sweet dessert, then you’ll want a waffle maker that can cook them properly. In this review, we are going to put three of the best home waffle makers to the test to see how well they can cook homemade waffles and reveal which one came out on top. George Foreman grills have a great reputation for grilling delicious food to perfection, so we thought we’d see if they could do the same for waffles. It didn’t disappoint and if you are looking for a grill that has multiple uses then this is definitely one to consider. Sometimes when you are reviewing a top brand there is a danger that you expect too much from it, and mark it down unfairly, so we made a point of trying to forget the brand and concentrated on how it performed. First impressions were good in terms of the design. It has a brushed finished which is platinum in color and gave it a very modern look. It is certainly heavier than many waffle makers you might come across, but this is to be expected given that it has multiple purposes and many useful features. Obviously, it is a grill for chicken, burgers, steak, vegetables, and poultry plus it can also be used to heat up paninis, so the fact that it can cook waffles means we have a grill that has 3 distinct functions. This needs to be borne in mind when considering its price and value for money as it negates the need to buy a separate waffle maker and panini grill. For cooking waffles, you obviously swap out the normal grill plates for the waffle cooking plates. The plates are ceramic so need a bit more care when handling them than metal plates would. The advantage of ceramic plates is, once you have finished, they are very easy to clean, or easier still pop them in the dishwasher. One of the biggest advantages of this home waffle maker is the digital controller. Not only does it have a timer, you have temperature control too. This means that you can set it to a multitude of different cooking temperatures and cooking times so that whichever way you and your family prefer waffles, it can be done. Those that like dark, crispy waffles can have them cooked that way, just as those who prefer light, fluffy waffles can have them too. Other great features include a drip tray so that if any batter overflows and starts to drip it can be caught before it makes a mess on your countertop. The grill lid also has a floating hinge which means the lid it will sit evenly when cooking so that your waffle has consistent texture and color. There’s no getting away from the fact that both kids and adults love Disney movies and of course Mickey Mouse is associated with Disney more than any other character. Disney’s Mickey Mouse waffle maker is fun, and kids of all ages will love it. 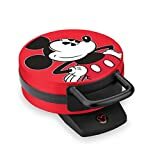 Cards on the table, we love Disney movies, however, that is not going to influence how we score their Mickey Mouse waffle maker. Honest! In terms of how it looks, this is one of the most unique home waffle makers you’ll come across. Its main body is a very eye-catching red color with a large image of Mickey Mouse in the middle. Put it this way, if you store it in a cupboard with a lot of other small appliances it won’t be difficult to spot. As we say about every product, ‘looks aren’t everything’, so we now come to how well it can cook waffles. The first thing to say is, if you are cooking for a large family who all want to eat waffles, everyone is going to have to be patient. The reason is that this Disney home waffle maker can only make one waffle at a time. Rather than the plates having the traditional square crisscross pattern that allows for two or even four waffles to be made, they have the outline of a Disney character…Mr. Mickey Mouse Esq. That’s right. Whenever you make a waffle with this product each one of them is shaped like Mickey’s head, including his large round ears. We found this made the fun of eating the waffles even greater as you can bite off his ears one by one, before devouring the rest of the waffle. Sorry, Mickey! The cooking process is as simple as could be. There’s a small Mickey Mouse logo on the base which illuminates when the waffle maker is switched on. This is a good safety feature in case someone doesn’t realize it is on and is tempted to touch the plates. Another useful feature is the rubber feet which prevent the waffle maker from moving when in use. To cook your waffle simply pour in batter to the base plate and then close the lid. Leave the waffle maker to cook for the length of time you require in terms of whether you want soft or crispy waffles. Then, serve it up, and cook the next one. Once you have finished cooking, the non-stick plates simply require a wipe with a damp cloth once they have cooled down. Lovers of the good state of Texas will know it is famous for many things; Cowboys, The Alamo, and who can forget JR Ewing? Now it has now given its name to a home waffle maker, so if you want your waffles in the shape of the lone star state read on. The state of Texas is known for its sheer size. It is the second largest state in the USA (Alaska being bigger) so you might expect a waffle maker bearing the name of Texas to be huge. In truth, it is one of the smaller waffle makers we’ve seen but that has its advantages, not least because with a weight of only 2 pounds it is easy to move, and it does not take up much room when it is stored away. In terms of its design, the main body of the waffle maker is round, with a hinge on one edge and the lid handles opposite it. The finish on the outside is brushed stainless steel and with the black trimming, it would grace any kitchen top should you decide not to hide it away in a cupboard. This is not a waffle maker that you are going to be able to make waffles in bulk with, unless you have plenty of time. Its plates only make one waffle at a time, although they are unique in terms of their shape. They are in the very recognizable outline of Texas, with crisscross lines across the surface. Although there is a ‘power on’ light there are no indicators for when the plates are up to temperature or the waffle is ready, so you are going to have to monitor and check as it is cooking. Obviously, the longer you let it cook the crispier and darker your waffle is going to be, so be aware of this if you prefer light, fluffy waffles instead. Both the top and bottom cooking plates are fixed, so they can’t be removed for dishwasher cleaning. However, they are coated with a non-stick material therefore once they have cooled, you can easily clean them with a damp cloth. 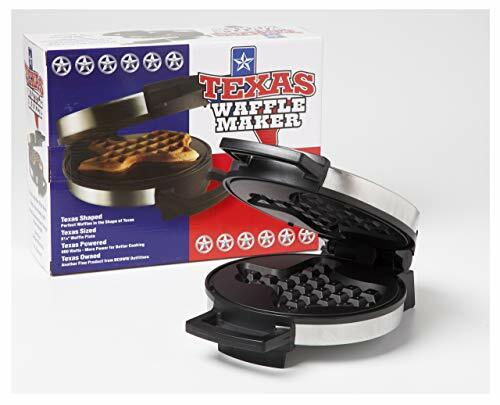 This is great home waffle maker if you are bored with normal square waffles and want to add a bit of fun to your waffle making, especially if Texas is as close to your heart, as eating waffles is. FLUFFY, THICK, DELICOUS: Your mouth will water as the smell of waffles fills the kitchen and the steam starts to rise from your Texas Waffle Maker. The kids anxiously await their tasty, golden waffles, and are excited when they arrive Texas Shaped! MADE WITH QUALITY: Our premium waffle maker is made of durable stainless steel, boasts large non-stick grids, and has powerful 800 watt electric grill plates. ENDLESS TOPPINGS: Top with maple syrup, seasonal fruit, your favorite jams, savory sauces, candied nuts, scrambled eggs and tomato, crumbled bacon and sliced jalapeno, sautéed veggies and cheese, and much more! EASY TO USE AND CLEAN: Includes a ready light to help you time your waffles. The light turns on when you start cooking your waffle and turns off when the waffle is ready to eat. Non-stick surface makes cleaning a breeze. Great gift idea for the Southern at Heart! Whilst we love the simplicity and the fun elements of both the Mickey Mouse and Texas home waffle makers they were up against a high-quality opponent. So, you won’t be surprised to know that the winner of the best home waffle maker is the George Foreman Multi-Plate Evolve Grill. 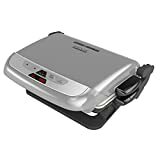 As we said in the review of this product it gives you 3 for the price of 1 in terms of being used as a grill for meat and veg, a panini/toasted sandwich maker and a home waffle maker. It makes great waffles which is aided by the digital controller that allows you to regulate the temperature and time so that every waffle is cooked to perfection. The ceramic plates also mean that cleaning up afterwards is as easy as pressing the ‘On’ button of your dishwasher.